MOHAMMED BOUAZIZI: Itualive! PERSON OF THE YEAR, CHRISTMAS DAY BOMB BLASTS AND THE IMPLICATIONS FOR NIGERIA | ItuaLive! The year 2011 is indeed a year of the revolution. A year hallmarked by rebellion, and uprisings from Tunisia to Egypt and then to Libya. Whether against hegemonic governments, or politicians and their politics, the revolts will make 2011 a year we will never forget. Be it the Arab Spring or the Occupy Now Campaigns on Wall Street, one thing is common to all-the people are fighting back. Arabs who before now were considered to be the most docile people on earth have since woken up. And it all began with one man- Mohammed Bouazizi. The choice of Mohammed Bouazizi as Itualive! 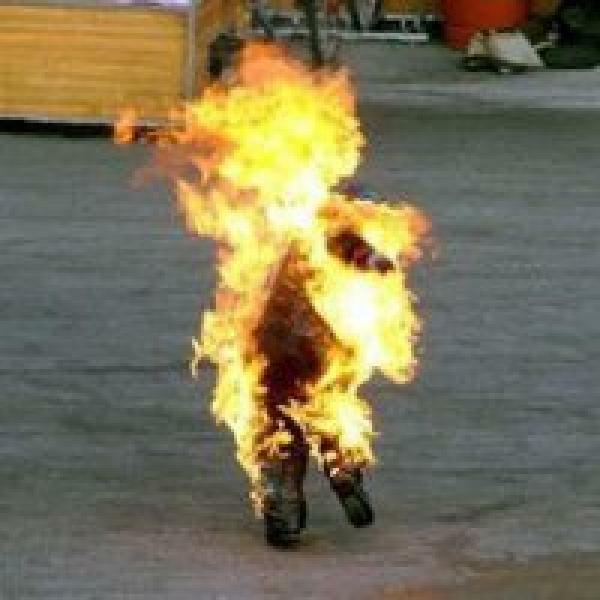 Person of the Year stems from the fact that his sacrificial act of self immolation led to the liberation of millions of people around the world. He inspired the toppling of dictators like Muammar Gaddafi and Hosni Mubarak. Mohamed Bouazizi (29 March 1984 – 4 January 2011); was a Tunisian street vendor who set himself on fire on 17 December 2010, in protest of the confiscation of his wares and the harassment and humiliation that he reported was inflicted on him by a municipal official and her aides. His act became a catalyst for the Tunisian Revolution and the wider Arab Spring, inciting demonstrations and riots throughout Tunisia in protest of social and political issues in the country. The public’s anger and violence intensified following Bouazizi’s death, leading then-President Zine El Abidine Ben Ali to step down on 14 January 2011, after 23 years in power. According to reports, local police officers had allegedly targeted and mistreated Bouazizi for years, including during his childhood, regularly confiscating his small wheelbarrow of produce; but Bouazizi had no other way to make a living, so he continued to work as a street vendor. Around 10 p.m. on 16 December 2010, he had contracted approximately US$200 in debt to buy the produce he was to sell the following day. On the morning of 17 December, he started his workday at 8 a.m. Just after 10:30 a.m., the police began harassing him again, ostensibly because he did not have a vendor’s permit. However, while some sources state that street vending is illegal in Tunisia, and others that Bouazizi lacked a required permit to sell his wares, according to the head of Sidi Bouzid’s state office for employment and independent work, no permit is needed to sell from a cart. Bouazizi did not have the funds to bribe police officials to allow his street vending to continue. Similarly, two of Bouazizi’s siblings accused authorities of attempting to extort money from their brother. Perhaps if not for Mohammed, these countries would still remain under oppression as they were before. Although I strongly believe that if it wasn’t Bouazizi, it would have been someone else. There is a limit to which you can oppress people. If these uprisings didn’t happen in 2011 it would have happened in 2095. Mohammed just ignited a fire that had been stoked for so long in the hearts of the thousands of young men and women in the Arab World. The question that keeps bugging my mind is this: how many times have the Nigeria police harassed and even killed hapless individuals over 20 naira bribes? Do we have to experience our own version of Mohammed Bouazizi before our Police men begin to treat people with courtesy? Police constantly oppress ordinary citizens and lock them up while the rich who commit the actual crimes settle with plea bargain. There is a continuous affront on the sensibilities of Nigerians by government officials and this must stop. The approach taken by government over the planned removal of fuel subsidy is yet another example of how not to govern. I do want the removal of subsidy because it is indeed bleeding the economy out, because am completely against anything that would make a few people rich at the expense of the poor. However I won’t support a policy where the poor pays for the sins of a faceless cabal. Some assurances that government can provide “shock absorbers” must be given first. There has to be an alternative way to redirect the subsidy so that people don’t suffer. If the government can for instance subsidize transportation in such a way that transport fares remain the same irrespective of fuel subsidy removal. This way, the transporters get the funds directly when the subsidy is removed. But talking about subsidy removal while the jets in the presidential fleet keep increasing is irresponsible of government. The superfluous number of presidential aides and the unnecessarily extra allowances shared by members of the NASS members is enough reason for the planned subsidy removal to be resisted. How long will the government punish its citizens for its own ineptitude? How long can Nigerians continue to condone this sort of harassment? Some Nigerians are beginning to regret the way they voted in April because it seems there is no clear direction to this administration. The truth be told, if PMS becomes 400 naira per liter, the proponents of fuel subsidy won’t buy fuel from their pockets. The Petroleum Minister, Finance Minister and Governor of Central Bank who are the protagonist backing the planned removal, are all driven in official cars. Their health and those of their family members are well taken care of and will certainly not feel the brunt the regular poor folks will feel. If subsidy must be removed, then everybody in government must be seen to share in the impact. It is Christmas today, but about this time last year I bemoaned the apparent incompetence of our security forces after two bombs went off in Abuja. And exactly a year after, Boko Haram has continued to slaughter innocent people. As at the time of this report, multiple bombs blast have exploded in Madalla, near Suleja. What makes this especially annoying is that the targets are now Christians in churches. Boko Haram’s manifesto of establishing an Islamic state is being carried out. Whole families were killed today (Christmas Day) at St Theresa’s Church. Apparently the government has no answer to Boko Haram. It is bad enough that government pays lip service to the protection of the lives and properties of its citizens, but what is particularly infuriating is that the ones that have been identified to having links with the sects have been let off easy. Ali Sanda Umar konduga (a.k.a Al Zawahiri), the man accused and convicted of being the spokesperson of the sect was sentenced to 3 years in prison. I haven’t seen anywhere in the world where terrorism is punished with a three years jail term. Is it that the blood spilled by Boko Haram doesn’t mean anything? This man should have been used as an example for anyone with links to Boko Haram. What are we now saying, blow up the UN building, blow up the police building, and kill all you can, if we catch you, we will try not to catch you, but if we do, we hope 3 years won’t hurt you so much. The Senator accused of having ties with Boko Haram was granted 25million naira bail! Where in the world does this happen? His colleagues have come to his rescue by saying, that he is innocent until proven guilty. For a senator to be accused of such am heinous crime is enough for him to resign. In a sane community, his colleagues will distant themselves from him but with Nigeria, it’s a family affair. While the reports of these blasts were being shown on Aljazeera and the BBC, NTA was showing a music festival. Their casualty figures are always lower than those reported by foreign media. Later on, they (NTA) put up a documentary on how Muslims appreciate Christmas and Christians apparently to douse tension even before officially breaking the news. The President’s said this in response to Sunday’s blast: “the era of Bomb Blast would soon be a thing of the past”. What does the President and his associate want Nigerians to do now before it becomes a thing of the past? Whatever plan he has for Boko Haram is apparently not imminent. For it will “soon” be a thing of the past. So what should Christians begin to do now? Train their own soldiers, or begin to import their own arms? I am sick of hearing about stakeholders meetings on security. People are dying, humans were roasted like chickens and yet we will grant a senator bail. We need to have our heads examined in this country. By the way, nobody talks about the Iranians that smuggled arms into Nigeria some time ago. I feel like I am the only one who remembers that arms that could start a Civil War were confiscated by the Federal Government. We still retain the same diplomatic stance with Iran and its back to business as usual. Shame, Shame Shame. Nobody saw Mohammed Bouazizi coming. Nobody envisioned or foresaw the domino effect his sacrifice could bring. I do not support violence in any form. But I do know that at the rate we are going, the people will begin to fight back. They will begin to say, “No, it’s enough”. Bishop T.D Jakes fondly says that nothing brings people together like adversity. Nigerians face adversity everyday in every form. Economic adversity, security adversity, corruption adversity, injustice adversity and oppression adversity. Egyptians moved to Tarhir Square to protest against their government. Right now Nigerians are protesting in their hearts; let’s pray we don’t have to go to Tafawa Balewa Square.